Don't look at the numbers, that's a very early result from 2008. Look at the current stand. 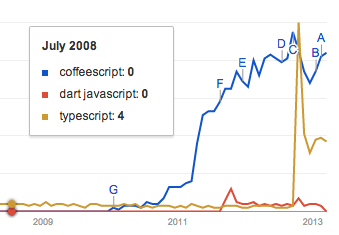 CoffeeScript is highly on the top. To be really honest I'm a theoretical Dart fan. Dart is kind, Dart smart, Dart is important. 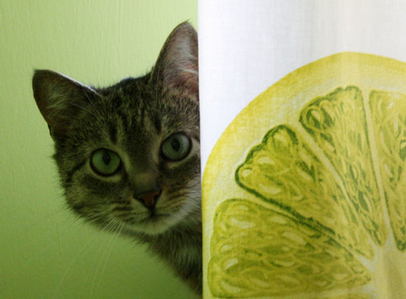 It know everything that is necessary for a JS abstraction layer - and was on the right path. No idea what's happening. It seems they are still working on it but I miss the buzz lately. TypeScript is pretty much Microsoft flavored and the website is designed for IE, so I don't think we should spend more time with it at this stage. GWT is still probably the top level carnivore on the field, but that is definitely not for a tired night to try out. I've did some small GWT projects and it's a joy to work with it. So CoffeeScript. I'm not gonna copy-paste the tutorial, you can check it out also. It has a basic structural abstraction, such as functions, classes, literal grouping. And it has a nice functional flavored extension embed in the language, which is always nice, like a free lollipop. And let's not forget about that's it's pretty dense. The workflow is also simple: you write your code in CoffeeScript syntax and compile it with an appropriate tool - such as the Node plugin. I just fired up PHPStorm and added the CoffeeScript support. Then I installed the Node plugin and compiled my sample file - works as expected. We'll see. Hope I can show you some diffs tomorrow. Ps. : I've just my friend's (James) blog where he created a game in Coffee - it's amazing! You have to check that out.